Home / Cripsy Fresh News / The Special RED Envelope! I have been excited to share this piece of news with you all for months. Today I finally can! In our early days as we began Lettuce Write, we asked our enthusiastic fans for their opinion regarding the colour of the envelope that their subscription packs are sent in. Red or Green? It was clearly a green win as it represented the ‘lettuce’ theme we have in our company. But there were a few comments on how a red envelope would be regal and special. Those comments are what inspired our new feature to be added to our standard subscription packs. Each month, one lucky subscriber of the standard pack (not our Baby Spinach mini-packs), will be randomly chosen to receive the special RED envelope in the mail. If you receive the Red envelope your pack will have a few extra stickers that no one else gets and that are extra special. 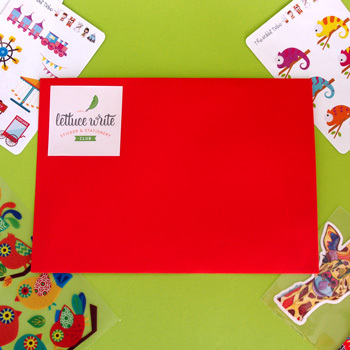 At the Lettuce Write headquarters we spend many hours sorting through different types of stickers and stationery products from all over the world to put together in your packs. Sometimes we come across some amazing stickers but they can not be added to everyone’s packs because they are either too expensive or they are made in limited quantities. This is why we have decided to introduce the Red Envelope. If you or your young one open the letter box and there is a RED envelope, congratulations! You are that month’s winner. 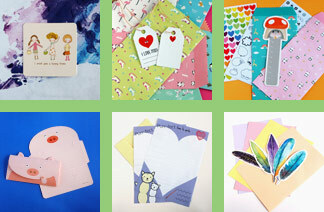 Inside there will be a handwritten note by Mjo and your special stickers as well as your regular exciting subscription. You are welcome to share a photo of your special stickers to Facebook, if you like. What do you think? Are you excited? Don’t forget if you receive the green envelope you still have a pack full of amazing stickers and stationery that have been handpicked for you, from all over the world! Keep an eye out in your letter box starting with our July packs.